Being responsible for turning the face of Indian fashion industry with unconventional prints, along with womanish drapes and silhouettes, blending modernity with tradition and defining the new style of modern Indian women is every fashion designers wildest dream. But she has been fearless to experiment with her designs and redefined the shape of Indian fashion industry with her flamboyant quirky prints and designs, appealing to classes as well as masses. She presented her first collection at the very young age of 19 in India’s most esteemed fashion platform, the Lakme Fashion Week in 2008. From there, she never looked back. She started her entrepreneurial journey at the age of 20 by starting her own eponymous brand. Today she is among the most influential and dynamic youth fashion icon in India. Meet the young and extremely talented Indian Fashion designer Masaba Gupta in a candid interview with me telling about her childhood, success story and upcoming projects. Ana: Hi Masaba, thanks for taking up the time to speak to me. Masaba: Hi Ana, Not at all, all pleasure is mine. Ana: Tell me something about yourself that people don’t know? Masaba: For me, most people don’t know that I am much stronger and smarter than I appear and catch on to people. I may look that I am ignorant about things but I am very sharp and I pick up personalities very quickly. Ana: As a celebrity kid (being the daughter of National film award winning actress – Neena Gupta and Cricket legend – Sir Viv Richards), how much pressure was on you to become famous like your parents? Masaba: I never felt any pressure as a child. There was no internal pressure and so I never took it seriously. However, there is a certain amount of pressure to take an advantage of and I used it when I was making my debut. Other than that, I never felt the pressure when I was designing or beginning of my journey in the fashion industry. This is something I continuously do because if you think that you do, people try to compare you to your parents and then you’ll never be going to succeed. What my parents did was very difficult…How they managed their success was very different…and how they managed the time was very different. I don’t compare myself to them because what I am doing now is very different from what they did. Ana: How was your childhood? Masaba: It was very normal than people think. I had very regular friends and used to do things with them like normal kids do. I did tantrums like any other kid. I traveled. My parents treated me like any other child. I wasn’t an overprotective child. My mom would want me to take my own decisions and she would like to understand and resolve things how they were. That has lots to do with who you are and shape you as an adult. I think when you see things as they are and are able to understand at a very young age, it is much easier for you to be a better human being than you are! Ana: Where did you grow up? As a child, did you have any hobby? Masaba: I grew up in Mumbai, India. In my free-time as a kid, I played tennis for almost 4-5 hours a day and I did swimming a lot. Ana: After studying music in London, what was the turning point in your life that made you decide to study fashion from SNDT University? Masaba: The topmost thing was I always wanted to be a singer. I studied music in London. I also learnt dance and lots of other creative stuff. But after coming back to India, I didn’t want to do singing any more and the only course open at that time was Fashion. So I literally enrolled because I had nothing to do. Ana: At 19 years of age, you presented your first collection ‘Kattran’ at India’s most prestigious Fashion show – Lakme Fashion Week in 2009. How did you get that opportunity? Masaba: It happened because, I remember, I was showing my line in my college graduation show and my mentor was Wendell Rodricks. After seeing my collection, he told me that I am ready to take the next step and should apply for Lakme Fashion week. At that time, auditions for Lakme Fashion week were open and I had a feeling that I should apply. I applied the same collection which I showed at my graduation show and I was in the second year of my college at that time. Ana: Tell me more about your ‘Kattran’ collection? Masaba: I liked patch works and Kattran means scraps of fabrics. So I collected all the scraps of different fabrics to cover the cost of unused fabrics and wanted to make my line cheaper. Ana: How did you decide to start your own label at such a tender age of 20 without having any entrepreneurship knowledge? Masaba: It was a very natural progression. I don’t think I have ever given a thought because the way my line was displayed at the Lakme fashion week and looking at the number of people and buyers having interest in it, I think that it was something very expected of someone who likes to do things when they are red hot. I like to do things at the right time when they work most. So I started my label at home. I didn’t have set-up then and that’s how it all started. Ana: Unlike the ethnic/bridal wears of other Indian designers, you are known for your unconventional prints and silhouettes and being fearless to experiment, defining the new persona of a modern Indian woman. Where did you get the inspiration for your designs? Masaba: I focus on doing variable clothing lines catering masses as well as classes. Unlike 10 years back, designer ethnic bridal wears used to be very expensive in India but now Indians want value for their money. Few of them have tight pockets and budgets for spending on bridal/ethnic wears. I try to provide affordable clothing line that ranges between Rs. 5,000 – Rs. 30,000 (approx. 75 USD – 450 USD) for all budgets so that everyone can wear my label. Ana: How do you select the materials you use? Masaba: It’s an organic process. We do silk and cotton. It depends on which kind of fabrics work for which printing technique. We do focus on that. Ana: How would you benchmark Indian fashion industry globally? Masaba: I don’t think that the world has realized the potential of India yet as a fashion destination. But we would emerge among the top five players in terms of buying power in the upcoming years. Whatever the impression of India about fashion in the world was, it has moved far ahead. Thanks to the internet, it is prudent to know what is happening globally in the fashion industry and world leaders in fashion need to understand the importance of India, not just as a manufacturing market but also as a buying market. If you want value for money, India is the place. Ana: Tell us about your few favorite projects that you did? Masaba: I designed the line of shower gels for Fiama Di Wills, which was my first time in Product designing. Secondly, I started the line for kids wear which is something very close to my heart. It is something which I am really good at and enjoyed doing it. Ana: What is your favorite part about being a fashion designer? Masaba: The fact that I am my own boss and you get to sell whatever you put your name on. Ana: How do you keep work life balance in your life? 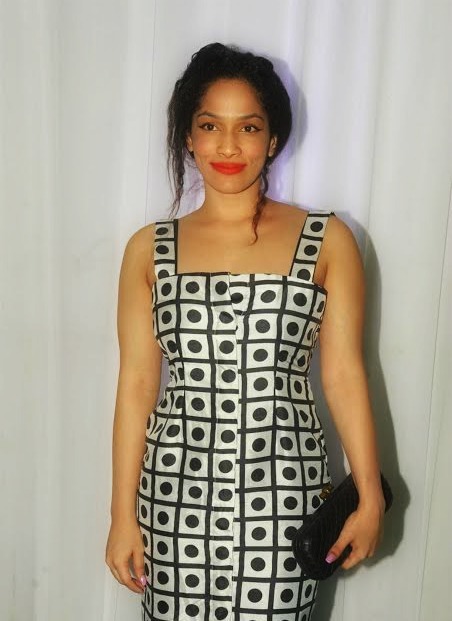 Masaba: I think that it comes naturally to me. I don’t have a problem in maintaining work life balance. I am someone who comes home and knows when I have to switch-off my mobile and when to switch it on and do my work. So I am very balanced at that. I don’t take on more than I could do. Ana: How supportive is your husband and his family in your career? Masaba: My mom is amazing and she is very active in my business. She takes care of my accounts when am designing. My husband is more of a silent adviser. He is someone who always pushes me to do things. He is a good motivating factor when ever I am feeling low. Ana: Do you have stores in the United States? Masaba: No, but we have recently signed up with a design hub in North America which is ‘House of Sonia’ and they will be exclusively retailing our saris and designs in North America. Ana: Who are your favorite designers? Masaba: I am a huge fan of Karl Larson and I am a huge fan of Stella McCartney. I like Anamika Khanna back in India. Ana: Which is your favorite holiday destination? Ana: Who is your favorite role model? Ana: What is your favorite pass time? Masaba: I love watching TV soaps back to back and my favorite is House of Cards. Ana: What advice will you give to young girls and boys who want to pursue their career in Fashion Designing? Masaba: There is no trial and tested formula. Some people work so hard but they lack talent and some people who have talent but don’t work so hard. It is important to be fresh and have a signature style and then do the rest. Ana: Describe yourself in one sentence? Masaba: A normal girl trying to live in an abnormal world…(laughing)! Ana: Thanks a ton Masaba for giving your valuable time to me. It was a pleasure talking to you. I wish you all the success in your career and all other future endeavors in your life. Masaba: You’re most welcome Ana, it was a pleasure talking to you too! P.S.- This post also got published in Huff Post, US. You can find it here. It is very nice to know about Masaba Gupta because she is one of my favorites. So, it was very nice to know about her. This was a very interesting interview to read. Thank you so much for sharing it! I always love to read interviews and about other people stories! They are so inspiring and motivational. Excellent effort, will be a great source of inspiration for new entrepreneurs! Really, interesting and Great interview. What a fascinating person to interview! I will have to keep an eye out for her work. i didn’t know about her, but I like her answer and her polite and bright face. So great you were able to interview her! Well done! My name is Ana and I'm the dorky girl behind this blog. Indian born but love to call the Sunshine State, FL as my home. This blog chronicles my passion of travel, style and everything-in-between. Thank you for stopping by & I hope you'll come back often!